It's simply magic! 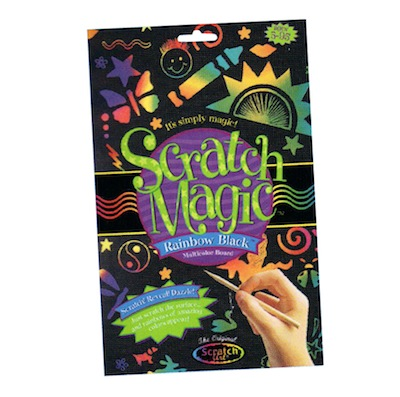 Scratch magic sets your creativity free in lovely vibrant colors. Make "stained glass" suncatchers, sparkling pictures, glittering paper jewelry, dazzling greeting cards, and so much more. Simply draw your masterpieces on the Scratch Magic sheets and watch spectacular colors magically appear. Completely safe and 100% fun. Acid and lignin free. Includes: 4 sheets Scratch Magic, stencil with more than 30 fun shapes, wood drawing stylus, and instructions.